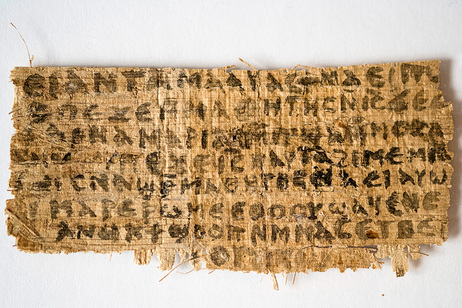 A three-inch fragment of papyrus is reigniting an age-old debate — whether or not Jesus was married. Karen King, Hollis Professor of Divinity at Harvard Divinity School, presented the fragment at the 10th International Congress of Coptic Studies in Rome earlier this month. Its owner, a private collector, wishes to remain anonymous. The small fragment appears to have been part of a codex or book, as there is text on both sides. Written in Coptic, a language used by early Egyptian Christians, one legible segment reads: “Jesus said to them, my wife.” King believes it is part of a newly-discovered gospel dating back to the second half of the second century. She thinks the fragment is a fourth century copy of the gospel, translated from Greek for Coptic-speaking Christians. “Christian tradition has long held that Jesus was not married, even though no reliable historical evidence exists to support that claim,” says King. “This new gospel doesn’t prove that Jesus was married, but it tells us that the whole question only came up as part of vociferous debates about sexuality and marriage. It wasn’t until the second century that writings emerged claiming that Jesus either was or was not married, and this second-century interest in the topic was likely a result of debates on whether it was better to marry or remain celibate. Although King does not claim the fragment as proof that Jesus was married, she says it shows that some early Christians believed Jesus had been married. King and a colleague, Princeton University professor AnneMarie Luijendijk, are writing an analysis of the papyrus fragment that will be published in the peer-reviewed Harvard Theological Review in January 2013. For a line-by-line translation of the fragment, and a Q&A by King, visit the Harvard Divinity School website.